I need you to know that I walk with my kid. And that my kid doesn’t look like me. I’ve only been a parent-like-thingy for a little more than two years, and it’s been an overwhelming bit of life and change and survival during that time, so I haven’t yet had a chance to do any reading or study on white parents raising mixed-race kids, so I need to admit that I have no data or research or counsel on anything I am about to stay except for my very raw emotions. These past 112 days, I have been outraged. The killing of Michael Brown, has torn my heart open. The violent response of our police and government to people demanding justice has shocked my lazy conscious into action. I have marched more miles than I can count and stood silently for hours in the sweaty summer heat, a bone-chilling fall rain and the winter snow. I have placed myself and people I love in danger to stand beside and behind the most creative, passionate and inspirational leaders I’ve ever not-met, who all happen to be 15 years younger than me. And whenever I can, I bring my kid along. I walk beside her through the streets of our city, of our community and chant as loud as I can over the lump always forming in my throat, that her life matters. And yes, I would march alone. I would march without her. I would march on principle. I would march because we all have to chip in if we are going to rid our systems and institutions of racism. I would march because I need to hear what my neighbors are saying. I would march because I think they’re right. And I would march because of my faith. I would march because God says we are all created in God’s image. I would march because God says to do justice, love kindness and walk humbly with God. I would march because God says to love my neighbor. I would march on principle. I would march on God’s instruction. I would march to protect all our children. I would march to say no to all violence. I would march alone. But most of the time I don’t march on principle at all. I march because God has asked me to protect this one child. God has given me this one child to help raise and encourage and care for. And she doesn’t look like me. And the world doesn’t see her the way the world sees me. And no one ever told me that I had to be careful around police, but I have to have those conversations with her. No one ever told me that I had to be careful about people watching me when I walk into stores, but I have to have those conversations with her. My white skin isn’t the threat that her dark skin is in the eyes of so many in our world. It’s a total cliché and still so very true and I hate it. So, now I see people watching my kid when she walks into the Family Dollar. I see people look at her when we walk into a fancy store. I see how people look at her when she’s walking through a parking lot and a salon and a restaurant and a church. I see how people treat her differently than me. I see it all the time. And that’s just what I see when I’m there. I am not there all the time. I can’t always walk with her. I can’t always protect her from those looks. Or worse. So I march. I march with her. I walk beside her and I hide my tears behind big, dark sunglasses and I march. I march because I’ve been stupid and ignorant and guilty for too long. I march because I’ve got to start somewhere. I march to protect her. I march beside her. Even when she’s not there. This post was originally written for the blog at RevGalBlogPals.org. I have followed the RevGals since first being introduced to them by one of the founders of the group, the Rev. St. Casserole, back when I was a volunteer working on the Gulf Coast post-Katrina. The site is for clergy women and their supporters to share ideas and writings and support one another. I’ve started contributing to the site, writing occasional posts for their feature called The Pastoral is Political. Oh, and I contributed an essay to a book the RevGals are publishing. You should check out their site. But not until after you read this. Duh. That’s what the lady was yelling when I found my seat. I had walked in to the church gym to find a whole herd of people sitting on the floor, linked arm-in-arm. Blank name tags were strewn about the plastic covered banquet tables that hovered above them. Just outside the door, lined up in a row, were the orangest orange hats you ever did see and a stack of vests the same shockingly noticeable color. There was some sort of agenda scratched out on the easel at one end of the basketball court, and a massive bowl of salad surrounded by a half dozen pitchers full of mysterious purple liquid at the court’s other end. That lady who hollered at me about going to jail, was standing over the seated herd, in a black t-shirt with the words “end racism” across her chest, gesticulating frantically, then climbing into the scrum of seated folks over knees and elbows, and tugging at their arms and shoulders, pulling them up, one by one. And yes, it was a clergy meeting. For weeks now, local youth, regional leaders, national activists, and yes, clergy groups, have been meeting, planning and organizing for the much anticipated grand jury decision over whether or not to indict police officer Darren Wilson in the shooting and killing of Michael Brown. Since that day in Ferguson, we all watched the community react, and here locally, the faith community has been involved in the response. August was all triage, and many worked to stop the violence, to stand for calm. Then in September there were meetings, so many meetings. October brought action, as thousands came to the St. Louis area for organized marches, protests, lectures, prayer meetings, concerts and gatherings. And now, November seems to be the month of preparing. And waiting. It is not lost on me that we are coming up on the season of Advent, a season of waiting and preparing the way. The church, in my experience, is actually pretty good at waiting. We’ve got the candles and the paraments all ready to wait stylishly in purple. We’ve got a whole section of songs in our hymnal about waiting. My tradition uses a committee system and Roberts Rules of Order to make sure we wait in order to make thoughtful decisions. And then, of course, there’s that whole waiting for the return of Christ thing that we’ve gotten really good at. So waiting is exactly what clergy and everyone here in our area are doing right now. We are waiting for the decision. We are waiting for that announcement. We are waiting for the reaction. We are waiting for the response from organized protesters and from police, from angry neighbors and from the National Guard, from civic leaders and from outside agitators, from mobilized clergy and from our elected officials. Business have already boarded up. An activist coalition has already trained more than 200 people for actions of civil disobedience. School principals are sending out emergency transportation plans and municipalities are issuing directives to stock up on water and supplies. Clergy groups have written litanies and are stocking congregations with supplies and volunteers so that they may serve safe sanctuaries in neighborhoods where violence or tear gas may explode. We have taken de-escalation training and ordered uniform clergy-wear (in that most orangest of orange), so that we can be identified on the front lines now that it is cold and our coats cover up our collars. We have filled out forms for who should be notified in case of our arrest. We have exchanged business cards and twitter handles. We have prepared for whatever may come when this wait is through. Because while we wait, we don’t wait idle. We prepare. Perhaps we over prepare. But this city is a mess, and the tension here is real. We can’t just sit and wait, so we just keep getting ready. 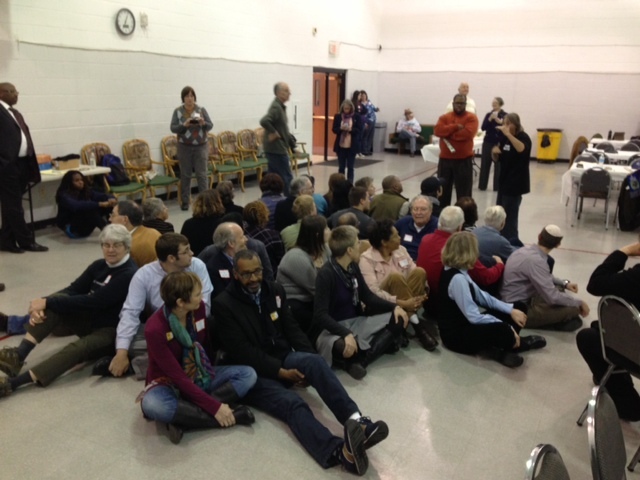 So today, a gym full of clergy, who normally stand up tall in pulpits, sat on the floor and waited. We listened and learned what it might be like to participate in planned actions. And as we have been doing for the past several weeks, we listened to the voices of others, other groups, other leaders, other agendas, other plans, and waited. It is a strange place for some religious leaders, who are used to being in charge, more comfortable leading the way. Clergy are used to being the ones up front and speaking, and are still called to do that here. But also to sit on the floor and listen. So while we wait, here in St Louis, but also wherever you are and whatever issues are causing your community to wait and prepare and wait some more, let us stand in those big pulpits on Sundays to preach the gospel boldly. But then, let’s sit down and get on the floor on Monday… waiting, listening, organizing, praying, preparing and waiting some more. Oh, That Good God o’ Last Minute Sermons. You’ve gotta preach. On Sunday. Every Sunday. From now, on. All the Sundays. I like to believe that God is involved and helps me figure out what the heck to say about this minor thing called THE WORD OF THE LORD that I am charged with sharing each week. From my own very personal perspective. For people to judge. Some of whom are still strangers. Some of whom know a lot more about the bible than me. Some of whom completely and totally disagree with everything I say. Some of whom don’t think I am funny. At. All. But Sunday comes around each week, so I say my prayers and go to my clergy bible study and read my commentaries and draft my manuscripts and pray and pray and pray and then I stand up and preach and sit down and just hope there was a tiny nugget in there that makes someone in that room think or feel or connect to God in some way. And I don’t have a system yet. Well, I guess I kind of have a system in that whole pray, bible study, commentary, write, pray, stand up, sit down thing I just mentioned. But I don’t map out a month or a season of sermons. I don’t write them in advance. And I am usually up quite late on Saturdays working on edits, okay fine, just starting to put things together. Some weeks an idea hits and I run with it and it works. Other weeks, I struggle. It can be a holy struggle, but it’s still a struggle. And then there was this week. I struggled through a sermon that just refused to come together. And even though I didn’t like it very much at all, I put it together anyway, because it was Sunday and I had to stand up and preach and sit down. So, I printed it out and readied myself to move on to Sunday School, because, well, Sunday School started in 10 minutes. Worship was an hour after that. I reminded myself that this sermon didn’t need to be anything special, or memorable, or awe-inspiring, it just needed to be true and not embarrassingly bad and done. It really needed to be done. So it was done. I hated it, but it was done. Printed. With page numbers. In order. And I went to put it on the pulpit and head to bible study. For some reason I can’t name, because I never do this, I decided to stop and read it out loud, from the pulpit, to see if I could make it work better if I just spoke it out. I spoke it out loud and realized I could move a few things around and it might have a better flow, and then if I tweaked a bit it would pack a better punch, and then if I kept moving things, it would have better consistency, oh, and then I could weave that theme throughout and someone was checking the sound system, and could hear me messing with my own words, fumbling though it and talking to myself, but I didn’t care, I finally had a flow. Or God did. There was a pencil there and I had all the back sides of the pages of my original, crummy manuscript, and so I just started scribbling notes. Four minutes before Sunday School. An hour and four minutes before worship. 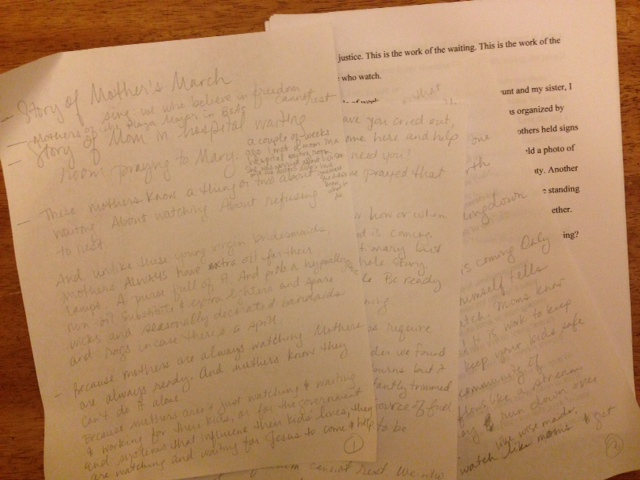 And that’s how I wrote an entirely new sermon, in 10 minutes, in pencil, standing at the pulpit. Because you gotta preach. Every Sunday. And some Sundays, God brings the good stuff at the last minute. In pencil.